This article have a study of the wireless group control system with variable frequency drive (VFD) applied in a Chinese plantation irrigation system. China is a fresh water resources scarce country, agricultural irrigation occupies a large part of the water resources. Because long-term use of traditional farming patterns, low utilization rate of irrigation water, irrigation water wasted is a very serious problem in China. 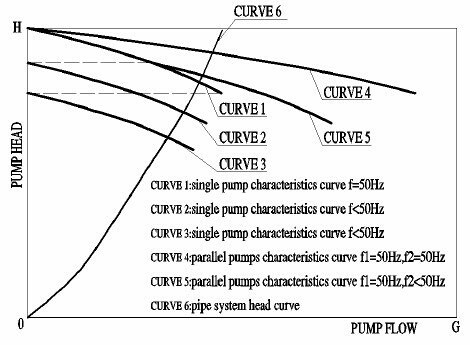 In order to improve the irrigation efficiency and save the water resource, based on an example of a large plantation in Shandong Province of China, this study designs a wireless group control system with variable frequency drive according to the specific situation of the irrigation wells dispersed. It realizes the communication between the main control room and 13 dispersed wells through wireless network. In the distributed sub-stations, we use the VFD to drive the lift pump to achieve the precise allocation of irrigation water, the saving effect is significant. Besides, the article especially introduces the software realization of the wireless communication. China is a fresh water resources scarce country, the per capita water amount accounts for only 1/4 of the world. The agricultural water use is the highest in all sectors; Chinese farmland irrigation water amount is 366 billion m3 every year, equivalent to the national total water 66.5%. In agriculture, water is used mainly to irrigate. Because of the long-term use traditional farming, also the economy and technology are not well developed, under its influence, China's waste of water in agricultural irrigation is very serious and the farmland irrigation water utilization rate is very low. According to the survey, China current irrigation area of 98% uses the traditional furrow irrigation; the effective utilization rate is only about 40%, while the developed countries are 70~80%. To promote water-saving irrigation, the use of reasonable supply and scheduling in agricultural irrigation water resources become more and more important. Reasonable and effective control systems in irrigation can greatly improve the utilization of water resources in irrigation. In this regard, we open up the thinking and apply the wireless group control system with variable frequency drive to the irrigation projects in the plantation, moreover, put it into practice have a study of the design and implementation of the intelligent monitoring system based on the arm. We study the long-distance data communication based on wireless communication technology. This study has a study of the wireless group control system with vfd applied in plantation irrigation system. China is a fresh water resources scarce country, agricultural irrigation occupies a large part of the water resources. Because long-term use of traditional farming patterns, low utilization rate of irrigation water, irrigation water wasted is a very serious problem. 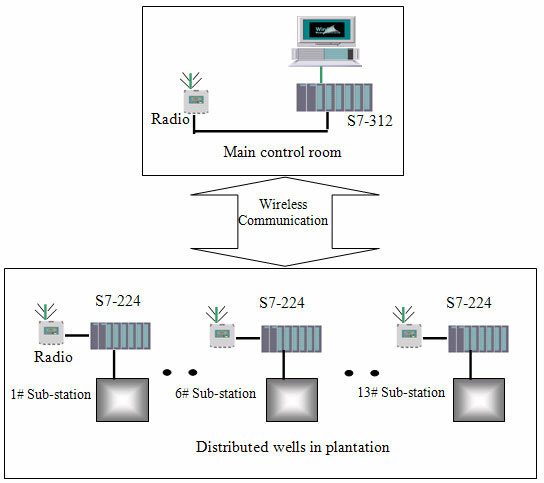 In order to improve the irrigation efficiency and spare the water resource, based on an example of a large plantation in Shandong Province, this study designs a wireless group control system according to the specific situation of the irrigation wells dispersed. It realizes the communication between the main control room and 13 dispersed wells through wireless network. In the distributed sub-stations, we use the VFD to drive the lift pump to achieve the precise allocation of irrigation water, the saving effect is significant. Besides, the article especially introduces the software realization of the wireless communication. This project's large-scale plantation base is located in Shandong Province of China, with a total area of approximately 30 ha. The Plantation terrain is very complex, there are different types of crops Area with distribution 13 underground pumping wells and each well is responsible for the irrigation of a crop area. All wells pumping motors are controlled by variable frequency drives, we can real-time adjust the pumping capacity by controlling the VFD's frequency. The total designed capacity of the plantation irrigation system is 10000 m3/24 hours; each of the 13 wells' pumping motor power is 18.5 kw, then the variable frequency drive is 18.5kw. The plantation has a main control room, in which is the central monitoring system, according to the water's demand of different areas, the central control system unified dispatches 13 wells to pump. Every well has a local sub-control system, which monitors and controls flow, pressure, variable frequency drive status signal etc. The sub-control systems collect all signals information, then sending them to the main control room and the central monitoring system in main control room achieves the wireless group control of 13 wells. The central control system issue control commands to the various wells based on water usage in real time, so that the base irrigation pump system is running in the best condition. The central monitoring system requires real-time communication with 13 separate sub-stations and each sub-station needs to place the information back to the main control room, from the specific irrigation system design, the reliability and real-time of the communication between the main control room and the sub-stations is a key link in the normal operation of the whole irrigation system. Selection of monitoring system: Because the pump wells within the plantation distribute dispersedly and the distance is far, the cost of the cable is too high, but we use wireless control mode is simple and cheap. Under the premise of the completion of the irrigation water supply requirements, according to the actual requirements of the project, the composition of the monitoring system and the required product selection should be based on reliable operation, advanced technology, simple operation principle. On 13 sub-stations, each sub-station uses 1 PLC controller, 1 EM231 and 1 EM 235 modules to set up a local control system. That we chose the PLC controller is because it has a cheap price and a relatively strong function, it belongs to the low-end controller of Siemens. The communication traffic and control tasks in a single sub-station are not very great, so, PLC is sufficient to satisfy the demand. In the central monitoring system, we choose 1 S7-312 controller, 1 CP-341 communication modules. The central monitoring system can wirelessly receive signals from 13 sub-stations through software programming. The configuration monitoring software is Siemens WINCC. We chose Gozuk 18.5 kw variable frequency drive 13 units, wireless communication radio is selected HAC modular digital radio, which communication distance is up to 10 km. Wireless group control system design: Figure 1 is a topology of the control system. Very easy to see through the drawing, with a quick and easy wireless transmission network between the main control room and the 13 sub-stations controlled by vfd, which can greatly reduce wiring costs compared with wired communication network. Wireless group control system features: Operators in the main control room can monitor the operating status of the equipment in 13 sub-stations, at the same time they can group control 13 sub-station through wireless communication. The main control room issued substation pumping values to the various sub-station controllers according to the water demand and the actual supply of water in the plantation. Using fuzzy algorithm, experience algorithm, the sub-station controller calculates VFD frequency values to meet the water requirements of the plantation, thus it can realize a reasonable supply of water resources. Introduction of the communication task: The controller in the main control room needs to maintain real-time communication with 13 sub-stations. It receives information such as flow, pressure, level of the well, the frequency of the vfd, the pump status of the sub-station, then transfers them to monitor computer through the radio linking with CP 341 communication module. Operators in the main control room send the commands to 13 sub-stations, such as variable frequency drive start and stop, pumping value information, thus they can realize the wireless remote control using wireless radio. Controller in the main control room once sends 15 words information to each sub-station, at the same time, receives 15 words information from each substation. Figure 2 shows the main program flow chart. Communication program Description of the controller: A cyclic timer is set in the main program: its time is 13 sec. The main station completes transceiver operation on each sub-station in 1 sec. The Main program calls the function FB 16: data received from each sub-station is after check sum calculation, if verified rightly and then it will be saved to the specified data reception area DB1. Setting a 3 second timer: when the user wants to separate operation on a specified sub-station, the timer generates a control signal of three seconds, immediately interrupt the cycle of operation of the original 13 substation; For the specified sub-station, it does transceiver operation 3 times, after the end of the 3 sec chronograph, the program automatic returns to the main program loop operation. Main program calls FB12 function: we use encryption algorithm in FB 12 to compute a data check sum word, when the PLC controller of each sub-station receives the data, it uses the same algorithm to check. The main program calls the send data function FB13: it sends all buffer data one time through the CP- 341 module. The main program calls the receiving data function FB 14: This faction saves the data received by the radio to the specified reception buffer. Main program calls the function FB 15: data that each sub-station transmits to the main station is saved to the specified data reception area. To call FB11 function module in the main program: Complete the program variables and initialization of the CP-341 communication module in FB 11; The controller generated 0.1 sec enable signal within one second in which the controller complete communication with one sub-station, while the sub-station's address is put into the first byte of the transmission data; the transmitted data is passed to the area of the specified sub-station. Communication tasks of PLC controller in each sub-station: When sub-station's radio is receiving the data, the PLC controller enters the interrupt service program. In which it checks whether the received data is right and if it is, the received data is stored in the D2 area, the local data stored in the D1 area is sent to the main station through the wireless radio. Figure 3 study the Sub-station flowchart. Sub-station's control program description: If the calibration data is correct, in the interrupt service program INT-3, it will save the data to another data buffer, finally the status data is transmitted back to the main station. 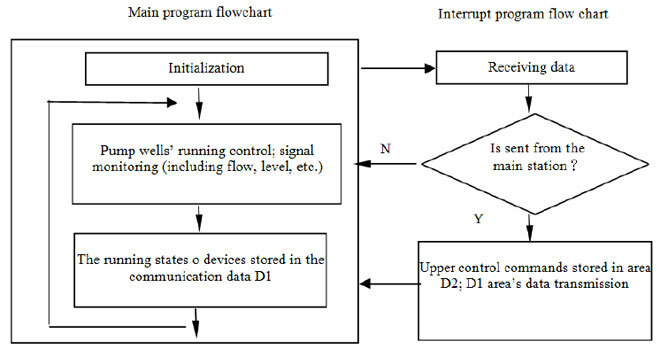 The main program calls SB10: set the interrupt control word in SB10, open the interrupt and connect INT-11 with receive events. 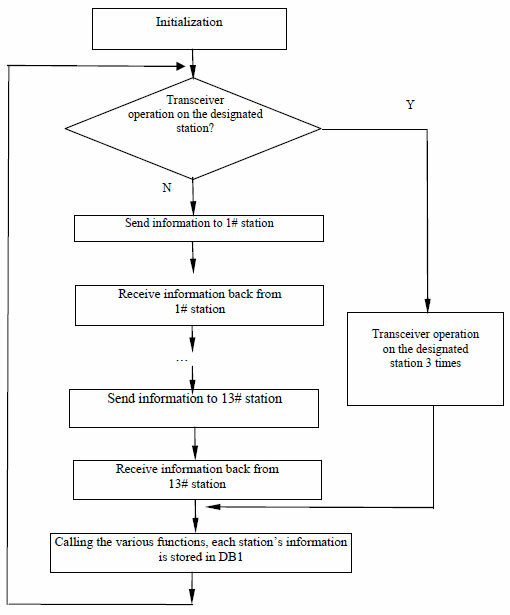 If the sub-station receives the data sent by the main station, it generates an interrupt and calls the INT-11 interrupt program, in which the received first byte is compared with the address of sub-stations, if same, then calls INT-2. In the interrupt service program INT-2, the controller loop receives 30 bytes data from the main station, after that, saves them to reception buffer and then verify the encryption algorithm and then calls INT-3. The main program of the sub-station includes equipment data initialization, as well as on-site pump wells operating instructions, such as opening and closing the pumping line solenoid valves, start and stop the variable frequency drive, control variable frequency value according to the pumping capacity. Since being put into operation of the wireless group control system with variable frequency drive, the wireless communication between the main control room and the irrigation area is stable and reliable, equipment operation is good. 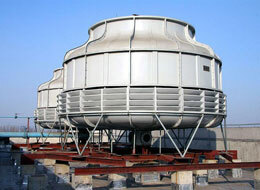 With the expansion of plantation area, the vfd wireless group control system can be extended conveniently. According to the Chinese plantation's estimates, it saves the irrigation water 30% on average per year compared with previously traditional irrigation method. Each year, about 50,000 m3 water is saved, variable frequency drive in pump irrigation has made a very significant economic benefits.